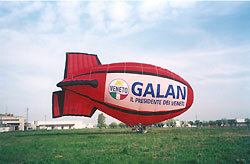 Un Another promotional method with infinite possibilities; the airship has been specifically studied for promotional use. 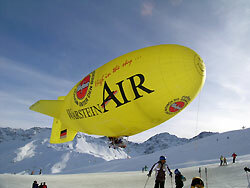 A airship is simply a hot-air balloon more aerodynamic, which allows it to be used at low altitude, it can be directed easily and at a reduced speed can pass over specific areas. The cover sustains a gondola that can carry two people, the burners that heat the air use propane as a propellant, and a motor which pushes the airship forward. Each cover can be fitted with a lighting system for night-time, which permits the airship to transform into a gigantic luminous sign! Each flight requires very little gas and petrol for the engine. A team of just 4 people is required to manage the airship, when not in use it can be folded and kept in it’s special bag. There is no need for expensive hangers and costly maintenance.